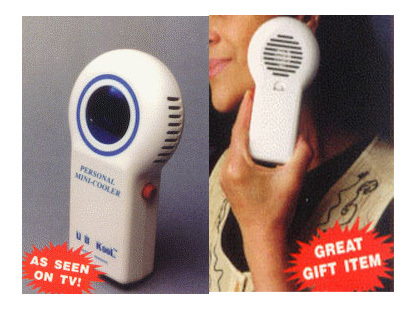 U-B Kool [U-B Kool] - $16.95 : NewDaVincis.com!, Great Innovative Products, Gadgets and more. Your Personal Ice Cube and Hand Warmer. Free shipping in within the USA Continent! The UB KOOL? 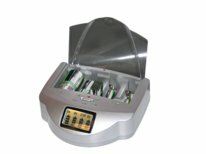 is the ONLY hand-held electronic cooling/heating system on the market. UB KOOL lets you instantly relieve stress and discomfort caused by the heat. Great product for the Golf player?on a hot day! 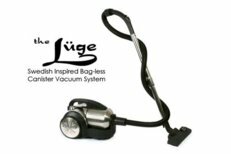 Portable - fits into any purse, fanny pack or sports bag. Operates on (4) AA batteries (not included) or optional AC/DC (not included). 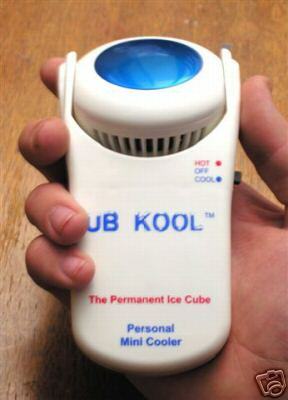 The UB KOOL personal mini-cooler is perfect for anybody who wants to stay cool. Push a button and send a cool sensation over any part of your body. The UB KOOL is Safe and Extremely Simple to Operate. Works on a NASA invented Solid State Cooling Chip energized by ordinary AA size batteries. Size of a cell phone. When a button is pressed, a smooth blue disk attains a temperature close to freezing. People experiencing excessive body heat due to physical exercise such as Jogging, Golf, etc. can "Cool Off" by gently pressing the cold blue disk against their cheeks, necks, fore heads, etc. Can be used again and again! Perfect item to sell at fairs and sporting events!